For the past couple of weeks, I’ve been spending some time trying to clean up some defective, yet “once-in-a-lifetime” type Hi8 footage I’ve shot for this documentary of mine. It’s a lot of work to repair some of this stuff, as it’s all very time-consuming. 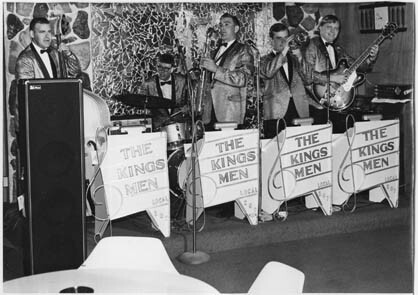 Today, I thought I’d share a photo of a band that called themselves “The Kingsmen.” This is a photo I purchased on eBay, and I really don’t anything about this group, other than the fact they were affiliated with a musical union as “Local 207.” If anyone out there in cyberspace would like to identify this group, where they’re from, or any other detail, that would be appreciated. I have no idea if this band ever did LOUIE LOUIE, but it’s definitely NOT the band from Portland, Oregon that had the big hit recording.